Most eyelid infections come in the form of little bumps, which may or may not cause pain or irritation, even though an infection is present. While an infection may be introduced by an external agent, eyelid infections usually involve either one or more of the oil secreting glands in the eyelid, or one of the eyelash follicles. Sometimes an infection is a secondary symptom of another disorder affecting the eyelid or the eye in general. Eyelid infections are seldom serious, although because of the close proximity to the eyeball, any infection, especially one which persists, should be careful monitored. Blepharitis - Most eyelid infections do not last long and generally go away on their own. Treatment may vary from hot compresses, which are often the most effective way of treating these infections, to antibiotics and anti inflammatory medications, or surgery, which is seldom required, and if needed, minor. Blepharitis is a very common type of eye infection. Its symptoms are eyelids that become inflamed, itchy, and at times swollen, and crusting of the eyelid or flaky scales may be present. The condition may last for several weeks, but can often be treated at home unless if becomes severe or the irritation becomes intolerable, in which case antibiotics may need to be administered. Chalazion, Or Stye - At one time or another, almost everyone gets a stye, in one of the eyes. The medical term for the stye is a chalazion, (plural - chalazia) and it usually consists of a single lump on the inside of one of the eyelids. Multiple lumps are possible, but uncommon. The chalazion or stye is created when an oil gland in the eyelid becomes blocked. Oil continues to form, but has nowhere to go, and swelling results in the form of a lump. A chalazion is sometimes caused by a blepharitis infection, but it can be caused by any number of things. The chalazion is seldom serious, and in most cases goes away on its own. In some instances, there may be inflammation, and if the eyeball is being irritated, it may be necessary to see a doctor. Occasionally a chalazion is drained through minor surgery. Surgery on an eyelid is usually minor, and performed using a local anesthetic. Most eyelid surgeries are done for the purpose of draining a stye or cyst that is causing irritation. Sometimes it will be necessary to remove tissue, and in rare cases tissue may be removed for purpose of performing a biopsy, if there is a potential for malignancy. Cellulitis - Blepharitis, discussed above, is usually a low grade infection. A more serious infection is cellulitis, which will often affect the entire eyelid, which may become very tender and warm, even hot to the touch. Cellulitis is usually successfully treated with antibiotics, but the infection has the potential to spread to the eyeball itself, so must be closely watched. An infection of this type should be brought to the attention of a doctor. 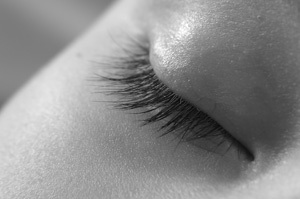 Ectropion, A Strange Disorder - A disorder that sometimes affects eyelids is ectropion. There are two kinds of eyelid ectropion, one of which causes an eyelid to turn outward from the eye, and the other which causes the eyelid to turn inward. While neither condition falls into the category of eyelid infections, the possibility of a secondary infection caused by irritation to the eyeball exists. Eyelid ectropion usually requires surgery to restore the eyelid back to its normal condition. Summary - In summary, most eyelid infections are temporary, and not generally serious, requiring medical attention only if the condition persists or irritation and swelling become severe. A primary consideration when a severe infection is the case, is that it not be allowed to spread to the eye itself. Eye drops, antibiotics, and warm compresses are the usual means of treatment, with surgery seldom a necessity.